Our tempestuous journey has come to a close. We are thankful to so many people and businesses. Our audiences continue to grow and our production this year has taken huge lengths forward as we bring quality programming to your backyard for FREE. We are already working on our 2013-2014 Season and are hoping for continued help from you. Currently we are working to expand our audience. Like us on Facebook, follow us on Twitter and tell all your friends to do the same. If you know of communities that might be interested in us visiting them during our next season, please e-mail us at community@stonesoupshakespeare.com. Additionally we are looking for some volunteers to assist in capturing images, editing video and working on a very exciting poster project for our next season. If you have experience in any of these areas, or have a quality digital video camera we can borrow (or if you are upgrading and are looking for a home for you old one) we would love to talk to you. We are working to maximize your donation dollars and match them with grant monies. Your help in anyway helps us as we move forward. For our 2013-2014 Season we are hoping to raise $15,000 in order to cover production costs, tour expenses, artist salaries and travel. Below is a list of where our money is going. If you are able to contribute please click on the DONATE link below which will take you to our Fractured Atlas campaign. Our partnership with Fractured Atlas means that your contributions are tax deductible. If you would like your contribution to go to something specifically let us know and we will make sure it does. If you see that we need something below and you can help us in other ways, please e-mail us. It's help from you that makes it possible for us to diversify the cultural opportunities available to our Tour region. 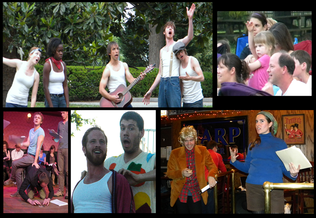 *Stone Soup Shakespeare is a sponsored project of Fractured Atlas, a non-profit arts service organization. Contributions in behalf of Stone Soup Shakespeare may be made payable to Fractured Atlas and are tax-deductible to the extent permitted by law. Fractured Atlas is a non-profit organization that serves a national community of artists and arts organizations. Our programs and services facilitate the creation of art by offering vital support to the artists who produce it. We help artists and arts organizations function more effectively as businesses by providing access to funding, healthcare, education, and more, all in a context that honors their individuality and independent spirit. By nurturing today's talented but underrepresented voices, we hope to foster a dynamic and diverse cultural landscape of tomorrow.